Clearly, online at clearly.ca, is the go to shop for contact lenses, glasses, and more. Clearly carries contact lenses, glasses, sunglasses, and a variety of lenses. Clearly also carries quality brands such as Oakley, Ray-Ban, Calvin Klein, Nike, Michael Kors, and more. Before shopping at Clearly, be sure to stop by RetailSteal.com for the latest Clearly coupon codes and discount codes. Clearly also offers shipping promos that change often. Visit RetailSteal.com for the latest Clearly shipping specials. Use code at Clearly and save 10% on any order. 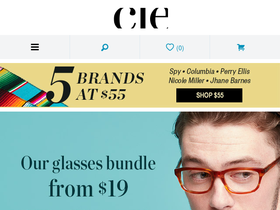 Use code at Clearly and save $30 on glasses orders $100+. Use code at Clearly and save 10% on contact orders $99+. Use code at Clearly and save $15 on contact lens orders $80+. Use code at Clearly and save 15% on designer glasses. Use code at Clearly and enjoy 1 free box with purchase of 5 boxes. Shop 5 brands for $55 with this code at Clearly. Enjoy free shipping on all glasses at Clearly.